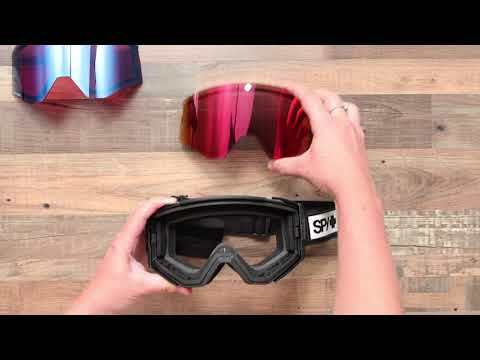 Slopeside goggles with a pair of interchangeable lenses for shifting light conditions. The Ace Goggles have a flexible frame that adapts to lots of different faces. Plus, they're helmet-compatible, moisture-wicking and won't fog up on warm days. Quick Draw lens system uses a simple lever system for fast lens changes. Happy lenses heighten contrast detail in challenging conditions, giving excellent clarity. Rise ventilation system combats lens fogging. Triple-layer Isotron face foam forms a good seal with moisture-wicking Dri-force fleece. Essential Camo colourway includes a spare Happy yellow with lucid green spectra lens with 53% visible light transmission. Phil Casabon colourway includes a spare Happy persimmon with silver mirror with 46% visible light transmission. Vents allow airflow through the goggles which helps to prevent fogging. These optics are designed to fit comfortably over most eyewear. A coating on the inside of the lens that inhibits condensation. Provides 100% protection against UVA and UVB rays.